Optical networks play a vital role in meeting demands like high data rates, high speed, and reliability in terms of security of user data. An enhanced security mechanism has been proposed to protect optical code division multiple access networks (OCDMA) against eavesdropping. 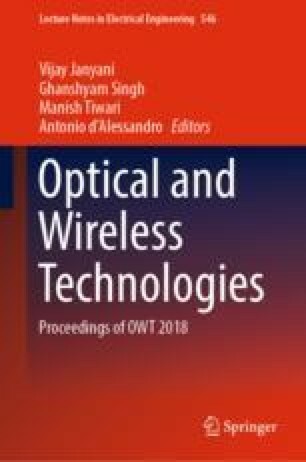 In this paper, we have presented a novel technique for SAC (Spectral Amplitude Coding) OCDMA systems for enhancing data security and to exploit the capacity of an optical system. The novelty in our approach is that we have done layering of simple matrix-based Multi-Diagonal codes with low cost and less complex optical Ex-OR gates. We have incorporated data security using Multi-Diagonal (MD) code which can be simply constructed using matrix manipulation. In addition, network is protected from eavesdroppers by introducing optical Ex-oring between coded data with random key sequences. Combination of MD code with optical gate structure maintains data security to a very high extent compared to only codes used in optical system. The system design is simulated on OptiSystem-15 and Simulation work estimates the performance of proposed system in terms of bit error rate and Q factor with and without eavesdropping.